The Lightning Clock by Andy Plant at the Royal Quays, North Shields. Location: The Royal Quays, North Shields. Materials: Copper, Stainless Steel, Cast Iron and Fibre Glass. 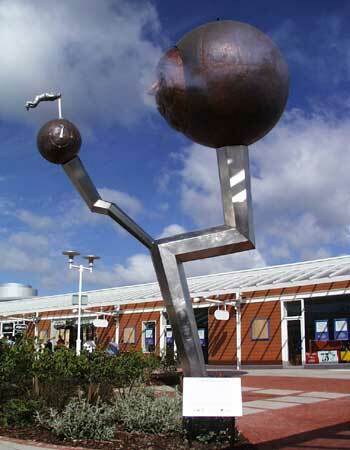 The Lightning Clock is 30 ft high, consisting of two beaten copper spheres fixed to a stainless steel column resting on a cast iron base with a fibre glass weatherman figure. At the base of the column meteorological instruments give the temperature, wind speed and wind direction and barometric pressure. Like a giant Van Der Graaf Generator, two spheres balance on top of a metal lightning strike which has exploded into the ground. In the larger sphere the North Wind rests. On the smaller sphere the weatherman rests enjoying the calm. As the hour approaches, all comes to life, The weatherman pulls a lever, the sound of thunder is heard. The face of the North Wind rotates, eyes rolling, and blows out smoke to knock the eatherman off his feet. Gradually, the storm dies down, all is quiet again... until the next hour strikes.